Shotel is a Weapon in Dark Souls 3. 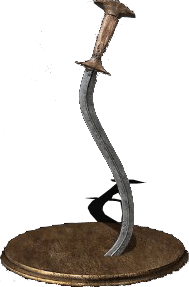 Broadly curved sword known as the favored weapon of the tragic Embraced Knight. Slice into foes with a large spinning motion, and follow with strong attack for a spinning vertical-slash. Can aquire two Shotels per playthrough. When used in the left hand, the weapon art turns into a parry. In place of kicking, pushing the left stick forward and light attacking at the same time activates a unique cartwheel dodge attack. The Horsehoof Ring has no affect on this attack. Has innate shield pierce: 65% on heavy attacks, 35% on the first and second spin of the weapon skill, 55% on the last spin of the weapon skill, and 15% on all other attacks. Purchased from Unbreakable Patches for 4,000 souls. The Chaos Shotel has a B scaling in faith and intelligence, not a C scaling. Saw the update. Figured my favorite lightning weapon combo would be useful again.Whipped it out in pvp. After upgrading to a +5. Did 40 damage through a kite shield. If I hadn&apos;t already purchased a season pass I&apos;d just leave the monotony to from and their quality raw weapon bs. Is the Shotel Better on a 40/40 built with Refined or a Dexbuilt with Sharp/Standart? Since Update 1.09 all shield piercing weapons now pierce shield. This one doesnt have it. Still doesnt go through? I love this weapon, if only they just changed the backstab/riposte animation. It&apos;s kinda immersion breaking. Maybe swap it with the GS riposte animation? Based on the damage calculator ( http://trogg.net/DS3Calc/ ) the shotel is the highest AR curved sword with the lighter attacks and backflip kick. Am I wrong? I think out of all curved swords, this one has the least amount of stamina usage. Its AR and move set also seems better compared to the scimitar but still uses less stamina. The note about not bypassing shields. Is this referring to all attacks by shotels? Wasn&apos;t only the strong attacks in previous games that ignored shields? Aside from the weapon art being great, it can&apos;t be parried. Just like how Patches tries to kill your character and sell your wares to other customers once you&apos;re dead, did Patches also kill Lautrec and is now selling his shotels? Patches does sell two and Lautrec wielded two. Has C/C scaling for Str/Dex and 187 from base damage, stability raises to 27. No changes besides that.With 33 str/dex I get 164 from scaling, pretty sweet considering it&apos;s only c, must be a higher tier of it. is this good for pvp ? From what I&apos;ve learned from playing the Souls games, don&apos;t trust an NPC that uses a Shotel.